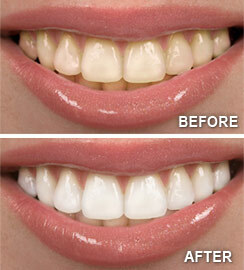 Teeth whitening is an excellent way to turn back time and erase the stains that can dull and discolor teeth. Dr. David Feeney offers teeth whitening services in his Matthews, NC dental office. He explains how this simple procedure can improve your smile. Tooth enamel tends to absorb brightly colored foods and drinks. Although brushing is helpful in removing surface stains, it can't get rid of stains that have penetrated your enamel. Tooth whitening agents contain ingredients that safely bleach your enamel, revealing lighter, brighter teeth. Visit the tooth care aisle of your local drugstore, and you'll see a variety of teeth whitening products. While these products can lighten your teeth, you many need to use them for weeks and repeat the process in just a few months to maintain your results. Not only is this time-consuming; it's also expensive. Professional Teeth whitening treatments performed at Dr. Feeney's dental office in Matthews is a safe, effective way to brighten your smile. It's also perhaps the most economical cosmetic dental procedure. When you visit your Matthews dentist for teeth whitening, the results can be dramatic: in-office whitening can lighten teeth three to eight shades in a single hour. Professionally supervised teeth whitening performed by Dr. Feeney will work faster, and protect sensitive gums and tooth-root surfaces better, than over-the-counter whitening products. Having an oral exam before you begin any whitening process is an important first step to make sure your tooth discoloration is not the result of a dental condition in need of treatment. Also, please be aware that it can be risky to have whitening solutions applied to your teeth by untrained personnel in shopping malls. If you have any questions about which teeth whitening method would be best for you, talk to our dental professional in Matthews, NC first. If you take good care of your newly whitened teeth, you can expect them to stay bright for several years or more. Here are a few things you can do to make sure your whitening results last as long as possible. First of all, please maintain your usual, conscientious routine of brushing and flossing every day, and keep up with your regular schedule of professional cleanings at the dental office. Finally, avoiding the foods and beverages that stain teeth will also help your teeth stay pearly white. Stay away from or limit colas, coffee, tea, wine, cherries, berries and other brightly colored foods and beverages for best results. When your teeth are yellow or dull, you may spend far too much time trying to avoid smiling or opening your mouth around other people. 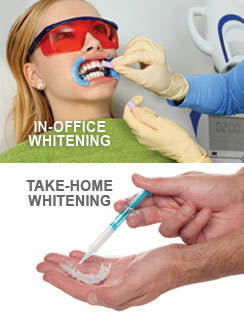 After whitening, you may be amazed at how much more confident you feel. Teeth whitening is a simple way to help you feel good about yourself. Dr. David Feeney, DDS in Matthews, NC offers professional teeth whitening. Call us at (704) 847-1000 to make an appointment!